For more than 75 uninterrupted years, the magical appeal of the eloquent music of The Mills Brothers has attracted adoring audiences worldwide. Honoured with a Grammy for Lifetime Achievement in 1998, The Mills Brothers' harmonies and unmistakable repetoire of hits still symbolize a legendary tradition to a new millenium of audiences. Among their memorable portfolio of recordings are such hits as "Tiger Rag," the original group's first hit from 1928, "Cab Driver," "Glow Worm," "Lazy River," "Yellow Bird," "Basin Street Blues," "Opus One," "Paper Doll" and many others. 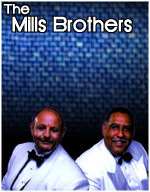 The number of Mills Brothers records sold is uncountable, certainly well into the many tens of millions. They had a certifiable hit each year between 1935 and 1947, and they kept coming through the mid-1960's and 70's with "Cab Driver." "Paper Doll" alone sold six million copies in its first release and it was just one of more than 2000 recording that produced at least three dozen legitimate hits. The magic continues unabated today under the leadership of John Mills - son, grandson, and nephew of the original group's members - who recreated the inimitable sounds of The Mills Brothers while vocalizing the multitude of hit songs that made them famous. John Mills had performed with his father, Donald Mills - the last surviving original - since 1982, and now brings to stage the newest generation of The Mills Brothers. The new duo includes and highlights the beautiful voice and compelling stage presence of the talented Elmer Hopper, who spent 21 years with the renowned Platters.